Home. Course. Advantage. Surely it’s worth something? For the first time in decades, the Harrier League was coming home. Well, our home anyway. The ever-growing popularity of cross-country running, and the North East Harrier League in particular, means that new venues are regularly required. And a new venue needs a new host. And that host, helped out by Heaton Harriers and Tyne Bridge Harriers, was us, Gosforth Harriers. The men’s Team Captain was the main instigator, plotting the course, opening discussions with the owners of the land and proposing the new venue to the Harrier League committee. The date was chosen and so, at 07:30 on Saturday morning, about 30 brave souls ventured out into a late October sleet storm to mark out the course. A couple of hours later, drenched to the skin and with fingers numb from the wet and cold, most of us took shelter, our job done, and waited for the first club tents to start appearing. In my humble opinion, the course was a cracker with a bit of everything: woods – every cross-country runner’s favourite – with tree root trip hazards to watch out for; undulating fields, nothing too daunting in terms of hills, although there weren’t really any flat bits on the whole course – it was either uphill or downhill; some water in the swampy far corner; some narrow bits that would test the elbows; and a gravel path that would challenge the choice of footwear. Tent City would be right next to the start and finish as well as providing the opportunity to cheer each competitor up an incline each time they started a new lap. The location was also great for accessibility. Straight off the A1, the main road through the North-East, plenty of car parking, lots of paths and trails through the woods away from the course on which to warm up and a pub for essential rehydration afterwards. Even better, I could walk there from my house! The horrible thunder sleet from the morning had given way to deep blue skies and minimal wind. Perfect conditions as the club tents started to arrive. I had volunteered to marshall, but there were so many volunteers, most of those who were running were relieved of their duties before the first race began. So, I was able to concentrate on the junior races and my own preparation. I took a position by the water jump for some photo opportunities and saw a combination of those jumping it (too wide to avoid getting at least one foot wet) and those just running straight through the six-inch deep pool. One of the jobs we did while setting out the course was to remove as many branches from the route as we could, including a few submerged in the muddy water, that could have turned a few ankles otherwise. For the first time this season, we had full teams out in every age group and gender. Maybe only three or four clubs can boast that at any single meet and it was noticed and commented on by representatives of other clubs as well. Lots of Gosforth vests drew encouragement from the many club members, friends and family, and maybe even a few Gosforth inhabitants enjoying a day out at our local park and popular dog-walking location. The marshalls, as ever, were super-supportive, encouraging everyone, but obviously giving special encouragement for those in green and white vests. Our ladies’ team looked to be putting in another really good performance, eventually finishing a strong second in their division. Returning to the tent, I started focussing on myself and my own run. I hadn’t had the best preparation. I had pulled a stomach muscle sneezing of all things a couple of days earlier, although I was hoping it wouldn’t affect my running, but the main thing was tired legs, having been on my feet constantly for six hours between setting up the course and the start of my run. My ankles were very stiff, so my main warm-up was focussing on loosening them up. Some days, everything feels good. This wasn’t one of those days. We had a men’s team photo and headed to the start line, making sure we had a good position in what looked to be a very big field. A row of Gosforth vests at the front of our home meet was very satisfying. With another runner promoted at the last meet, it was great to have another couple of potential counters doing their first run of the season. That’s the trick to surviving in Division One and something that, as a comparatively small club, compared to others in Division One (and most in Division Two), we suffer from. A third of our regular senior men are now running from fast pack and, therefore, unlikely to finish in the top 100. I lined up next to and chatted with the North Shields Poly runner who normally finishes very close to me and we waited for the gun to go. There’s no ‘On your marks, Get Set…’. You line up and then you hear the gun go off. I thought the starter was to my right. He wasn’t. He was about two yards to my left and the gun scared the pants off me! And we were off. After the first 100m, there was a bend to the left, so it was important to get good position into that bend. Two runners shot off in front of the rest of the field. One looked like a runner. The other didn’t. They reached the first turn about 10 yards in front of anyone else and carried on at that pace. Around the bend and up the uphill gravel path, which was the reason why I had chosen to wear trail shoes rather than spikes again, past the supporters cheering you on. A left turn, more uphill before a right and a quick left into the woods for the next three quarters of a mile. This was our terrain. We train on these paths, through these woods, most weeks. The route we were taking was part of our 700 metre loop. I know the boggy bits and the firm bits and how to take the sharp left-hand corner without losing speed. I felt my pace was good. Challenging, but good. Not too fast. Not too slow. I was in about 40th place and had three clubmates ahead of me. A good team position. Downhill now towards the water. Not worth jumping – it was too crowded on the first lap anyway. A very sharp, very narrow left-hand turn next. I made sure I got good position for that. Plenty of Gosforth support, driving you on. Out of the woods and up the main hill on the course – we run this in training as well, normally the other way, but I knew the tricky undulations of this grass – and then the steep downhill at the top into the next field. I passed one of the two guys who shot off at the start – the one who didn’t look like a runner. Maybe he was trying to get in the photos! More Gosforth support, including information on your position in the field. It’s so important to know that. Down a hill along a hedge, up another hill, then down a hill and we were onto the second lap of three. A touch under 2 miles per lap. I have to say, the course marking was excellent! I was level with the Poly runner. I knew I was pretty much at my limit, ten seconds behind a clubmate I am normally very close to, but whose form has been getting markedly better over the last few weeks with a good sequence of regular, consistent, injury-free training. Then I saw something that was a first for me while running cross-country. About 200 metres into lap 2, still passing the spectators around tent city, there it was, lying on the gravel path in front of me. A crisp, plastic £10 note, folded in two. The thoughts, decisons and assessment of the consequences of the obvious instinctive action that went through my mind in the split second after seeing it would have blown many a powerful computer. If I stopped to pick it up, I would lose five, six seconds, maybe. Nothing in the scheme of things. But those five or six seconds would be five or six places. What would my clubmates say? That I had valued a measly tenner over the success of my team. So what if I did stop to pick it up? Have you ever had anyone in a race stop right in front of you? I have, and it’s not pretty. I was about half a mile into the Great North Run about 5 years ago and the woman immediately in front of me hadn’t done the zip of her pocket at the rear of her shorts up. Out flowed keys, coins and a credit card. She stopped to pick it all up and caused absolute carnage with people crashing into her as she had to force her way upstream to pick up the important things up. I managed to avoid her only by almost taking out the person to my right. Maybe the carnage wouldn’t have been quite so drastic as then, but it would still not have been pretty. By the time my brain had processed all these thoughts, I was well passed the tenner anyway and my decison was made for me. It would be somebody else’s lucky day. It wasn’t there next time I passed! I started struggling with a tight chest on the second lap, unable to take as deep a breath as I wanted. Often that means the onset of a cold or chest infection. We’ll see next week. I was now tracking closely behind the Poly runner, staying with him, but no more, throughout the second lap, in 45th place, according to the Gosforth marshalls giving the information. I reckon at least the top 60 would be promoted today, but the fastest medium and fast packers would soon start coming past me. Onto lap 3. It was now a case of hanging on, using the downhills as best I could, maintaining my pace on the uphills, but there was a steady number of runners passing me. 80th place at the halfway point of the lap. The Poly runner was about 5 yards ahead of me, but I made that up on the steep downhill, drawing level with him. Could I maintain that? If I could, I was confident I would beat him in a sprint finish. The tightness in my chest was getting worse though, like I was wearing a very tight heart rate monitor. The finish wasn’t coming soon enough and I started losing ground again without being able to respond. It was time to really dig in with each grassy stretch. Round the penultimate bend. The Poly runner was now more like 10 yards ahead. I wasn’t going to make that up. All I could do was ensure I wasn’t going to lose any more places, especially not to runners from Division One teams. Every point and, therefore, every place, may count in a close divisional race. The last bend and then a good 120 metres to the finish line. Uphill, of course. I had a Heaton Harrier – a Division One club – maybe four yards in front of me giving everything he had. Over the last 20 metres, I put on my usual strong finishing burst, passed him and crossed the line just in front of him. I hate finishing funnels. All you want to do is stop and/or collapse, but you have to keep moving, instructed to do so firmly, and necessarily so, by the funnel marshalls. The Heaton Harrier I had just passed patted me on the arm from behind to shake my hand and the Poly runner was waiting for me to shake hands at the funnel exit. I just beat him last time out. He just beat me this time. Fantastic competition between the two of us though and I look forward to our next meeting. I was the fourth Gosforth runner home. The fifth came in shortly after me, but we then waited a long time for the sixth and last counter. That could be crucial in the standings for today’s results. While recovering, I listened out for chat amongst the runners from other clubs about what they thought about the course. Without exception, it was positive. ‘A good test’, ‘Nice course’, ‘Deceptively tough’, ‘Loved it’, ‘Hope this is a regular venue’. It also turned out to be popular in numbers. An all-time Harrier League record attendance for the senior men with 625 finishers. That also meant the top 62 finishers would be promoted. We had two runners in that category which will make the rest of the season even tougher in the fight against relegation. I came 94th. Not my best performance, but not my worst either. Probably about 20 seconds slower than what I was hoping for based on my comparative placings at the last meet at Druridge Bay where I thought I had run pretty well. I was quite happy with my splits. Miles 3 and 5 and miles 2, 4 and 6 were all pretty consistent times, aligned with the more uphill first half of each lap and the more downhill second half. The incentive I had to stay with the Poly runner was important mentally. It kept me focussed, despite the tightness in my chest making it a more painful run than most. By Wednesday of the following week, I was coughing and spluttering with a full-on chesty cold. Having a target or anchor is an important tactic to gauge how you are doing. Pick them wisely, stay close and then see how you feel in the last portion of the race. As a team, we came 8th in the division, missing 7th place by a measly 9 points (258 v 249). In the division, we are one place above the relegation zone. It’s going to be a tight one. With so many runners now in the medium and fast packs, and in addition to regular training, we may need reinforcements, although, unlike other clubs, we don’t have too many members who haven’t run cross-country yet this season. While the volunteers took down the course, the runners did our cool-down before some of us retired to the pub for a liquid debrief and to reminisce about a long, but thoroughly enjoyable day while watching the results come in online. It felt like it had gone really well and, hopefully, will become a regular event in the Harrier League calendar. Once again, huge thanks must go those closely involved in preparing and staging the successful event. Some upcoming travel means I have a couple of weeks away from competition, which I hope will give me a chance to get healthy again. After a first Harrier League outing where my summary was that it was something to build on, it was good to have a quick turnaround to the next meet just a week later. It had been a decent week of training. A tempo session, a track session and a long run mixed it up nicely and my legs were feeling pretty good on Sunday morning. Some good performances from our juniors were well earned by those who are always at training and have the right mentality for distance running. Not everyone has that mental capacity to rinse themselves inside out physically on a regular basis, both in training and in races. Once again, a course recce was crucial. There had been some rain during the week and it was raining during the recce as well. The grass would be wet. Was there any mud? What were the corners like? Well, there was no mud to speak of at all and the odd corner may have been a little greasy for road shoes, but the main issue on this Druridge Bay Country Park course is the long, gravel path which is tough on spike-wearing feet on firm ground. My decision was to go for trail shoes. I watched some excellent performances in the ladies’ race while warming up, including a third place finish for Gosforth, but was shocked to see the winner was more than two minutes ahead of the next fastest. She was an outstanding athlete, still looking really strong in the home straight. We sometimes get world class athletes at Harrier League and other northeast club events. Olympians Laura Weightman and Aly Dixon are occasional participants, as well as several GB triathletes (including a few from Gosforth Harriers). Aly Dixon actually holds the Strava crown for one lap of the Druridge Bay course. But the overriding benefit of running is back in the main field. It is so heartening to see clubmates and other friends getting faster, being promoted, achieving podiums or even winning big, local races. It’s also fantastic to see the other end of the age spectrum, where the focus may be more about slowing down the slowing down process or keeping active. And from a health point of view, one friend from another club has recently lost 3½ stone in just seven months and is now in the middle of the pack rather than at the back. All deserve the applause and support of the spectators and, I’m happy to say, get it. I heard the whistle go to signal the gathering of the men’s start. I quickly made my way to the start line and was there fast enough to bag a spot right at the front. It was another big field. 550 plus. I went through my mental preparations, telling myself how I wanted to run this race. Firstly, don’t go off too fast, then don’t go off too fast and, finally, don’t go off too fast. The gun went and the hordes started off on the 100 yard or so stretch to the first corner. I was probably about 15th by then. By the next corner I was about 30th and the placings settled down with about 45 people ahead of me before the first mile was done. I was happy with the pace. In fact, I was thinking whether I had gone off too slow. A quick look at my Garmin showed 6:23 pace. Definitely not too slow. Just about right. I was glad to be wearing my trail shoes as we went onto the gravel path for the first time. I could hear the clickety-clack of the guy wearing spikes next to me as he veered left to find the bumpy, narrow streak of grass to run on. I found I was able to push on down that straight, overtaking a couple. The next section had some damp corners. How would my grip hold out? Perfectly, was the answer, even taking the corners quite sharply. I traded positions with a Sun City Tri runner going around the two hairpins and made a mental note of him as he put on a burst and pulled away ten or so yards on the next section. A quick look back on a corner and I could see another couple of Gosforth Harriers no more than 15 seconds behind me. That was good. This is a team game and we need some good counters at every event to stand a chance of staying in Division 1. I finished the first lap as a North Shields Poly runner who I recognised drew up alongside me. We are similar levels, but he had beaten me quite convincingly in the Nationals earlier this year, the last time we raced each other. Together with a Ponteland runner and the Sun City Tri runner from earlier, we were all fairly well matched, running quite close together. The wind was brisk and against you going along the top grassy section and onto the gravel again. There were certainly benefits to finding shelter behind someone, saving energy, but you needed to be right behind them, almost within clipping distance. Once the wind was partially shielded by the hedge, I pulled out to the side and accelerated a bit, once again using my trail shoes on the gravel path to good effect, managing to drop all three and put enough distance between us that they couldn’t use me as a windshield. I was now starting to overtake the odd slow pack runner who couldn’t keep the early pace up, as well as being passed by the fastest medium pack runners, most of whom would be promoted to fast pack for the next meet. A quick look at my Garmin and the pace was 6:30. Still bang on. Onto the final lap. Hearing support from all around the course, from both seniors and juniors, was tremendous. I was dreading the third lap being as painful as the third lap was last week at Wrekenton but it wasn’t. I was feeling good and my pace was fairly constant. With half a lap to go, I was now down in about 65th position given that a few fast packers were now overtaking me, having made up their handicap. Expecting the promotion cut-off to be about 55th, I was safe from that. A teammate from medium pack passed me, making me now second counter for Gosforth. We exchanged encouragement as he went passed. I pushed the pace up a notch as much as I could. Just under a mile to go. A long grassy straight followed by the only real uphill on the course. Drive up that hill. No holding back now and a shout-out from the club coach to push on with only 400m to go. Then the finishing section. A sharp right and onto a bumpy downhill, a sweeping left and the finish was 70 yards ahead, slightly uphill and giving it everything. It’s great for spectating, seeing all the races within races culminating in sprint finishes, last minute overtaking and lung-busting efforts to get one over on your rival and secure one fewer point for your team (fewest points = better). About halfway up the finishing straight, the noise of the crowd seemed to explode. It wasn’t for me. I wasn’t going to be able to overtake anyone ahead. It must be someone behind me, catching me. With 25 yards to go, a Jarrow runner overtook me on the right, sprinting, all out. He had put everything into his sprint finish to that point. One of my specialities is the sprinting speed I can generate in the last 20 metres of a race. It has gained me valuable places in all sorts of races. As soon as I saw the Jarrow runner in my peripheral vision, I put on that burst, overtaking him again and safely crossed the line, maintaining the position I had going into the home straight, almost taking the runner in front of me as he slowed on the line. 77th place. Safely outside the promotion zone. 45 seconds faster than last year, although the course was slightly shorter this year according to my Garmin. 150th fastest out of 564 finishers. 9th out of 98 in my age group. More Gosforth runners came in in quick succession. We shook hands and started the recovery process, welcoming each runner home. It meant a 7th place finish (out of 10) in the division, although we did have one runner promoted, the same as all of our main divisional rivals. The race to avoid relegation is going to be very tight with four teams now seemingly in the mix a third of the way through the season, although we are best placed of those four teams at the moment. Some runs leave you in such a happy mood and this was one of those. My mile splits were right on the money. I beat all the targets I had identified and really enjoyed it. We did our cool down, as is always recommended after a hard run, packed up the tent and headed home, but not before saying hello to some gorgeous Highland cattle. The organization of this event was also excellent. It’s our turn next at the end of October, but I have another couple of races before then. The Beast from the East weather system that hit the UK in early March caused the postponement of the last episode of the Northeast Harrier League due to travel concerns, but, happily, only for two weeks. Despite an awful forecast of strong winds, snow, sub-zero temperatures, even harsher with an easterly wind chill, and adding a couple of inches of rainfall during the week leading up to it, the North East’s hardiest cross-country runners gathered at Alnwick Castle for most people’s favourite course on the NEHL circuit. We arrived expecting the worst underfoot conditions, but they turned out to be amazingly good – the best conditions of the whole season. Whoever put in the drainage solution for the pastures around Alnwick Castle, please apply to Herrington Park to sort that out. Gosforth Harriers’ men’s team were in pole position to take the Division 2 title and secure promotion to Division 1 next season. We just needed to get a full team of six out to ensure promotion and finish in sixth place or higher to guarantee the title. There were a few injuries and other absences meaning we fielded our smallest team of the season, but we hoped it would still be good enough. Pushing for promotion or avoiding relegation tends to encourage clubs to pull out all the stops and field big teams in the last event of the season, no more so than the relegation bun-fight in Division 1 where any two of seven of the division’s ten teams could end up going down. After some excellent performances by Gosforth’s juniors, securing a first and two second places on the day, it was time for the senior men. I was cold warming up in three layers, so I decided to wear a base layer for the run. Then took it off, then put it back on, finally deciding to take it off. Vest and shorts for me and several of the Gosforth team, in contrast to most other runners. I did wear gloves and ear band though. My ears always get cold and, since my hand operation in December, my hands really suffer to the extent that it is distracting from my running. My warm-up went really well. Learning my lesson from the Nationals, I limbered up my ankles ready for the battering they would take on the uneven surfaces around the course. I had read through my blog from last season’s Alnwick fixture and remembered that I died somewhat on the last lap. I didn’t want that to happen again, although that was when my body was pretty tired from marathon training. My recent training has been intermittent, mainly due to work requirements and also partly down to the weather, but at least I was fully healthy. The heavy snow flurry at the slow pack start had passed over by the time of the medium pack start. I was surprised how many runners had turned out. Yes, the field was smaller than usual, but still a decent size. This would be the last time I would start from medium pack. Having failed to secure my spot in that pack for next season, I would be starting in October from slow pack and, hopefully, able to score well for the club again. I looked around for any targets and couldn’t see any in the melee, but I was feeling good and ready for action. The whistle went and off we set, heading downhill towards the castle. There were a few sploshy bits in the first half mile, but, taking a right turn onto the long uphill section of the lap, we were, by and large, running on grass rather than mud. I picked out an Alnwick Harrier around my age, as my target. Alnwick also had a chance of promotion from division 2 and had a big team out, especially as this was their home fixture. No sooner had I identified him, then he powered up the hill, leaving me standing. I resisted the urge to chase him down. I felt my effort levels were spot on, although the biting wind was at its worst on this, the most exposed part of the course. A right hand turn at the top of the hill and onto the forest section. In previous years, this had been very rutted, but not really at all this year, enabling me to power on. The smaller field was helping as I was now passing large numbers of slow pack runners, but still had plenty of room to pick my route, only once being slowed down. Another sharp right and the biggest, steepest downhill of any cross-country course with a 100ft drop in less than a quarter of a mile came into view. You just have to let go and hope that your footing is sure. You can lose a lot of time and places on that hill if you don’t throw caution to the wind. A final right turn, through the start / finish area and onto the second lap. I was amazed how good I was feeling. I didn’t have the lap-two-lethargy that normally afflicts me when I start to tire, but am still so far from the finish. Turning onto the long climb again, I saw the Alnwick Harrier who had surged ahead of me at the same place on lap 1. I caught him and passed him half way up the hill, thinking that he had gone off too fast and also the fact that I was maintaining my speed well. My watch said I did slow a little on that second lap, but only by a few seconds. Passing the start / finish area to start the third lap, I saw I was catching one of my usual medium pack targets whom I had not seen at the start, but who had been well ahead of me on lap one from pictures I saw after the race. He has a very distinctive running style and provides a real benchmark to how I am doing. He is in the same age group as me and we often finish very close in all sorts of races, although he beat me by over a minute at Thornley Hall Farm, the last Harrier League meeting. This provided a real incentive for me to give everything on this last lap. I caught up with him on the bottom straight, and ran behind him up the first part of the hill. I took the inside line on a left hand turn, drawing level. He clocked me and I’m sure he put on a burst as he then pulled away a couple of yards. I responded and tucked in behind him for the rest of the hill. I love these little in-race battles. Approaching the top of the hill, I moved to the right, drawing level with him again, giving me the inside line for the next turn and a clear run through the narrow, single-file only, 30-yard stretch of the course. He tucked in behind me and overtook me again as soon as he could when we started on the forest path. I had felt really good on the first two laps through the forest and felt confident to accelerate. I overtook him again and floored it down the very slight decline. With less than a mile to go, including the big downhill, I told myself this was like the home-straight and gave it everything I dared. He couldn’t respond and I pulled away. I was blowing a bit by the time I turned right for the big downhill but tried to relax and, without much traffic to pass, I followed the trodden path down, which was probably the fastest and safest route. As the hill levelled out and with maybe a quarter of a mile to go, I started scanning for division two team runners to pass. There were two Saltwell Harriers about thirty and forty yards in front of me. It would be tough, but I’d give it a go. I was catching them with every stride. I turned into the home straight and saw the finish a good hundred metres away. Going hard from a long way out, I passed the first Saltwell Harrier, was passed by a Wallsend fast packer and just managed to hold off a Durham City fast packer in an all-out sprint for the line. I’d given everything and felt like I’d had a really good run. I was the eighth Gosforth runner home and there were some stand-out performances in the top six counters. Surely we had done enough to secure the title and promotion, but we needed to wait for the results. I finished in 119th place out of 345 in 43:45 and 6th in my age group by time out of 46. If I hadn’t had the handicapped start, I would have finished in 29th place and been promoted. Easily my best run of the season. I beat my time on this course from last season by 23 seconds and my mile splits varied between 6:55 and 7:10. An incredibly even run for any 10k, let alone a hilly cross-country. Of the four segments on Strava, I had three PRs on the final lap. More importantly, when the results came through, the team had finished fourth on the day, thereby winning the division two title by four points from Jarrow and Hebburn in second place. 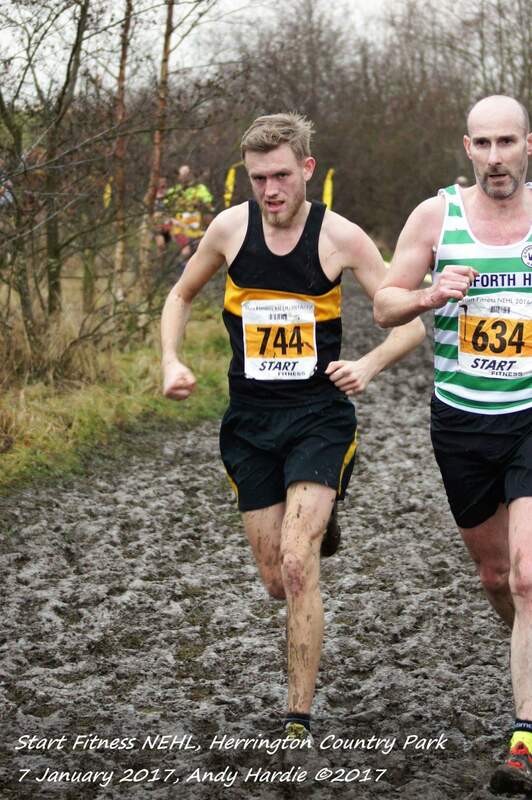 For its size, Gosforth Harriers punches above its weight in cross-country. Of the 49 competing clubs, 16 other clubs had more senior male athletes than Gosforth who turned out for at least one event. But each Gosforth runner took part in an average of 3.5 out of the 6 events, which is much higher than all but one other club and by far the highest in the top two divisions. Of the 59 runners from all clubs who turned out for all six events, there were 5 runners from Gosforth, again, more than from any other club. Dedication, consistency, coaching, training, captaincy and team spirit are all there in abundance. And maybe a little bit of talent as well. And so, the 2017/18 cross-country season comes to an end. It’s been a long, cold winter and I think we are all looking forward to some nice warm evenings on the track. Kudos to the NEHL organising team for the whole season and to Alnwick Harriers for putting on the final event in testing conditions. After a fairly dry winter so far, we had had two weeks of wet weather with the preceding three days of fairly heavy rain. The first three Harrier League events had been remarkably dry. We wanted mud; we got it this time. In abundance. I had had four weeks off running due to surgery and I was amazed at how much fitness I had lost in those four weeks. In my three training runs on the comeback trail, I was struggling to post a sub-7-minute mile and my heartrate was through the roof. So this Harrier League event couldn’t have come at a worse time to put in a good performance and the conditions were going to make it doubly hard. In previous race blogs, I often talk about identifying target runners to beat or keep up with. Today, there would be no targets. The main competition for me would be the course and myself. This was the course at which I posted my best ever Harrier League finish of 27th last year. The course at which I was promoted to the medium pack. I could remember plenty of mud then, some hills, an excellent stretch through the woods and a remarkably clear run due to being at the front of the slow pack. The course had changed slightly this year, making it a bit longer and, I’m sure, hillier. And I would be starting in the medium pack, meaning a clear run would not be had. Another big, strong team from Gosforth Harriers was out in force, supporting the juniors and the ladies, who put in an especially brave performance, before lining up at the start. It was windy and cold, with a few spots of rain in the air. The weather forecast had threatened sleet showers at race time, but at least those didn’t arise. From the warm-up, my feet were already wet and cold, but all this would be the same for everyone. The whistle went to set off the ever-growing-in-size medium pack. My normal target was not there, so I felt no pressure to stick with him which would have resulted in me burning myself out early. I ran at my own pace. The first half mile is all downhill with a stretch on a packed gravel path. I could barely feel my feet, they were so cold. A left turn and a jump over a trench that would no doubt have caught a few out in the crowds of the main pack, before a grassy stretch to the first uphill of the day covering the best part of a mile in thick, brown, ankle deep mud. I wasn’t doing too bad, probably a little better than I thought. My heart rate was under control and I was in the midst of the medium pack rather than struggling to keep up with it. The first mile done in 7 minutes exactly. There were still a few grassier patches allowing you to take a slightly longer, but less muddy route, the outside of a bend for example. Then all the height that you have expended so much effort gaining is lost in a downhill stretch, starting off with a steep, still very muddy, part which had you slipping and sliding down it. The human body’s ability to maintain balance never ceases to amaze me. By all rights, the slipperiness and speed should have caused many tumbles, and maybe there were a few, but I didn’t see any. Then a good, packed gravel path with a grass option to the side, through some big puddles of mud , still all downhill, before a sharp turn into the forest section. The marshall’s warning of “Watch out for the logs!” was well-timed. Three, maybe four, fallen trees were across the path and had to be jumped or ran round. I was now right in the middle of the slow pack meaning plenty of congestion, especially getting over the logs and the prime route through the forest, on the left of the path, was already taken by a long stream of runners. I found myself being slowed down several times due to the traffic. And then I started being overtaken by fast pack runners. I hadn’t even completed the first lap and I was being overtaken by fast pack runners! They had made up the 2 minutes 40 second handicap they had on me in the space of just under 2 miles. I had slowed though and it wasn’t just due to the traffic. The second mile, even though it was mainly downhill, was in 8.03. Exiting the forest is where all the spectators are. Encouraging shouts from the Gosforth supporters spur you on, give you a little burst of speed. A sharp left turn and onto the second lap, jumping the trench again. 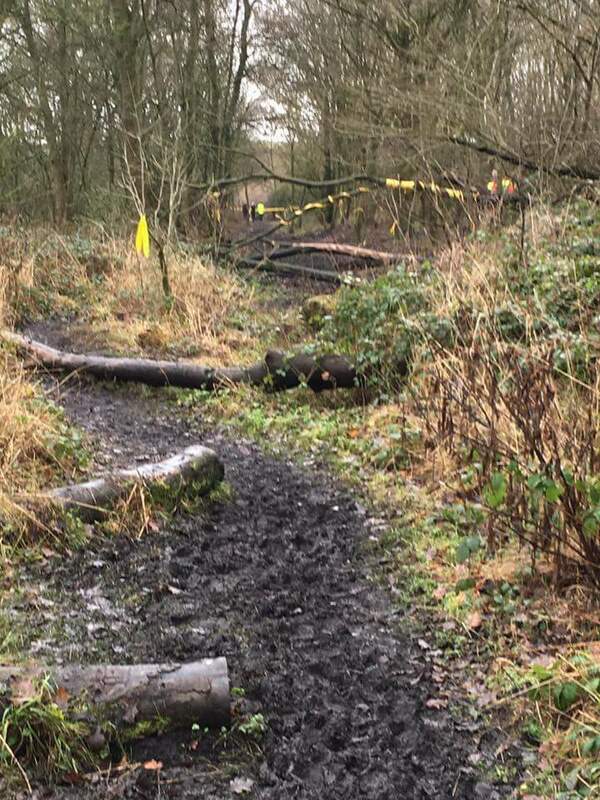 Whereas on the first lap you could find some less muddy routes, that was no longer the case. The course markings were also a little sparse. It was pretty obvious which side of the posts you should run on (i.e. the right side of them on the long, sweeping left hand bend), but there were a lot, and I mean a lot, of runners running on the grassier, left hand side of the posts. Some must have been all of ten yards left of the posts, basically cutting the corner. I would have been more annoyed had I not been starting to really struggle myself. I felt I was barely moving on the steepest parts of the uphills. My legs had nothing. The medium packers that I had been keeping up with on the first lap were now well ahead of me and I was just focussing on myself, maintaining whatever momentum I had. The uphill mile 3 wasn’t too bad at 8.01, but the downhill mile 4, the second part of the second lap, was 8.18. My lack of fitness and strength was telling and I was starting to cramp in my hamstrings. Lap 3 was even tougher, but I was digging in as well as I could through the strength-sapping hills and mud. I was passing a few Gosforth runners now, encouraging each one as I went, especially those who had turned out even though they were ill or injured. Mile 5 in 8.09. The last time through the forest and, instead of a left turn for another lap, we took a right to head towards the finish. That reminded me of the nightmares I have honestly had since last year’s race where I just keep on taking a left-hand turn and onto another lap, never taking the right to the finish, consigning myself to a never-ending loop of muddy, hilly hell! The last 550 metres is all uphill. I was empty. There was a runner from Crook, another team in our division, that I made sure I passed, and then passed two more from division three clubs, with whatever burst of speed I could muster – you definitely couldn’t call it a sprint finish. The next runner from Elswick was just too far away. I crossed the line in a bit of a daze, although I do remember that even the finish funnel was ankle deep mud. I’ve never seen that before! I met up with the rest of the team and quickly shuffled off to get some warm clothes on and get my spikes off to put a dry pair of socks and my wellies on. My feet never really warmed up on the run and I couldn’t feel my toes. With my recuperating hand preventing me doing any lifting or even getting it muddy, I was not going be any use helping to put the club tent away, so I said my goodbyes and went to the nearest well-known fast food outlet to get a strawberry milkshake. There are probably better ways of getting a protein fix that don’t also contain 400 calories, but it was exactly what my body was craving at the time! And it was gorgeous! So, the results are out. Another good day for Gosforth. A third-place finish in the division, with no one promoted, means we are now five points clear at the top with two rounds to go. As for me, my pre-race expectations were well-founded. Finishing in 45:30, I came 253rd, easily my worst Harrier League result, and I would have been 142nd without the handicap. My average pace was 7:53, compared to an average on this course last year of 7:08. So, I now have some hard work to do to get back to full fitness. More regular attendance of training sessions, getting some of these excess pounds off and putting a race plan together for 2018. The first one of these is next weekend at the Durham Relays. It seemed mightily early in the year for the first cross-country meet of the Northeast Harrier League season, but the rallying cry went out for Gosforth Harriers to get their spikes on and head down to Wrekenton. The Gosforth senior men were relegated from Division 1 last season. We just didn’t have the strength in depth to compete as a number of our runners were promoted and given handicapped starts. Starting this year in Division 2, we were looking to bounce straight back up. In what would be a competitive division, every finishing position was vital. Wrekenton isn’t my favourite course, mainly because of two long, fast downhills on gravel/chipping paths which don’t go well with spikes and are hard on the heels. I still haven’t bought myself a decent pair of trail shoes, so spikes it was. The ground was still fairly firm with only a couple of areas where you could conceivably slip on mud. The weather was perfect. Calm, fair, not too hot, not too cold. A good day for cross-country running. The field looked big. The Northeast Harrier League seems to grow every year. Last year’s Wrekenton men’s field was 532. That was 17% up on the year before. This year’s field turned out to be 589, another 11% larger than 2016. A 30% increase in two years is seriously impressive and no doubt without its challenges, so hats off to the organising committee. Having been promoted to the medium pack last year, I would spend all of this season in that pack unless I got promoted to the fast pack. And that is very unlikely to happen. Roughly, the fast pack contains the fastest 10% of runners and the medium pack the next 15% fastest. Looking at the faces I was lining up with, and with my fitness being no more than average at the moment, I was probably going to finish towards the back of the medium pack. We waited the 2 minutes 20 seconds after the slow pack mass start before the whistle went to set us off for the first of three laps. A flat 200 metres led straight into the first uphill, short and very steep at first and then gradually flattening out before hitting the first of the steep downhills, a sharp right turn and then a long, steep, straight climb to the highest point on the course where a lot of the spectators were. It would be easy to go off too fast and screw up the rest of the race. You had to treat that start with respect and the pace your Garmin was showing wouldn’t tell you anything useful. Going up that hill, about half a mile from the start, we were passing the first back markers of the slow pack already. That trickle of people to pass soon became a flood when we hit the main field. The fastest ones from the medium pack were pulling away and I was trying to find a target, a benchmark to use to gauge my pace, but it was difficult because you were passing so many. The course then narrowed significantly to a path, maybe two people wide. The only way to pass was to run wide of the path in the long grass on uneven ground when that opportunity arose. The only alternative was to hang back and wait for the course to widen again. I didn’t wait. It took more energy, but it was worth it from a racing point of view. You still lost time though. Around a group of trees and then back onto a similar, narrow path. More passing on the outside required. Finally into open country for a few hundred metres and then a long S bend, first right, then left. I was feeling in control, on the right pace. Another long, steep uphill now, good support all the way from various clubs. It was still busy, but I seemed to be running at the same pace as a South Shields Harrier and a Northern Frontrunner, both from the medium pack, the three of us interchanging positions as the terrain changed and depending on the route we were able to take through the field. What goes up must come down and the second nasty downhill met us, sweeping around to the left before a sharp right and onto a stretch called the Embankment, an elevated pathway about 400 metres long that took you back towards the start / finish line. Lap 1 – done. Crossing the line, I noted that I had completed that lap in 12:20. I had no idea whether that was good or bad, but it gave me a benchmark for the second lap. I always seemed to be struggling to maintain contact with the Northern Fro ntrunner and he pulled away on this lap. I was still with the South Shields Harrier though. At one point I was 10 metres ahead, then he caught me up and pulled away from me before I got back in touch with him. We were like that for the whole second lap. It was a bit clearer now, less of a need to leave the path to pass, but those hills are killers; strength-sapping; taking you into oxygen deficit zones where you don’t want to be. I had passed some Gosforth runners and both gave and received encouragement from each one. It’s part of being a team. The boost you get just from a “Go on son!” or “Give it all you’ve got!” can’t be measured, but it exists. I finished lap 2 and a few mental calculations told me that I had done it in 12:55, a whole 45 seconds slower than the first lap. The adrenalin you have at the start plus the fact that the first two hills are completed at a lower heart rate must contribute to that difference. I jarred my left heel on the first downhill of the third lap, maybe landing on a stone. That would hurt tomorrow morning. 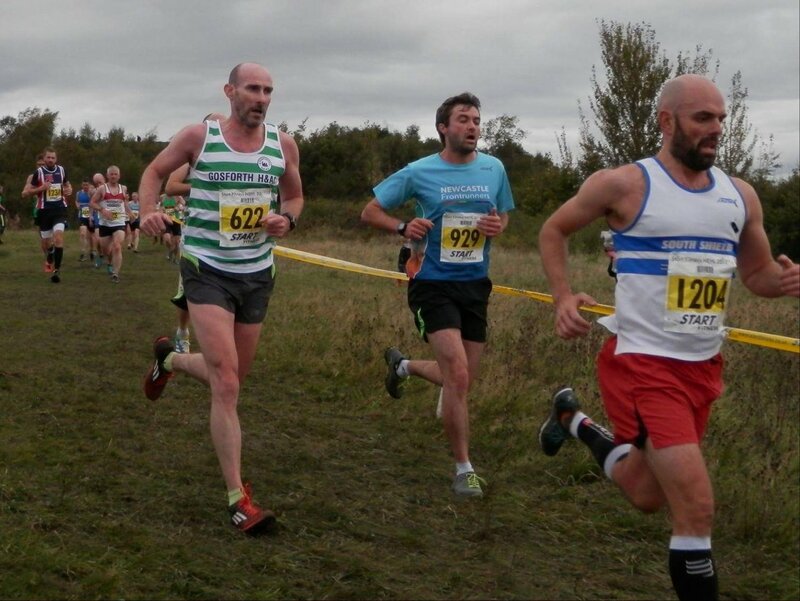 I didn’t feel like I was slowing, but I lost ground on the South Shields runner from then on. He seemed to have another gear and just pulled away from me. I was caught and passed by a flying Gosforth fast packer. On the other hand, there were a few casualties dotted around the course, being treated by first aiders or hobbling back to the finish area. Cross-country is tough. I had already seen a young lad from a junior race with a gaping gash in his ankle, obviously from an accidental spiking incident, being treated by the medics at the finish. He required stitches. A Gosforth runner had stopped on the last steep hill. Not knowing what the issue was, I shouted “Come on. Don’t stop now!” as I passed, hearing other spectators giving him encouragement as well. I seemed to meet another large pack of runners coming down the last hill, stopping me from hitting top speed on the way down, but as soon as I got onto the Embankment, mentally, I was almost home. I managed to pick up the pace a bit, not being passed by anyone and passing a few myself. A sweeping right bend and into the home straight – a full 150-odd metres of lung-bursting effort to the line. I felt someone passing me with about 75 metres to go at some pace. It was the same Gosforth Harrier who had stopped on the hill. Whatever problem he had, it was fixed. I moved into sprint mode myself for the last 50, overtook a couple more and finished just behind the Gosforth athlete who had just passed me. Walking down the finish funnel, a few retches and over to the posse of Gosforth athletes who were home already. I was the 11th Gosforth finisher, although that was from medium pack, and so wasn’t going to score this time round. Removing that handicap, I was the 6th fastest, reflecting some really good, fast athletes who have joined us over the last few months. Looking at my Garmin stats, my first mile was in 6:15, the next four closely grouped between 6:52 and 6:59 with the last 0.6 miles at 6:36 pace, a little slower than last year when I was probably in a slightly better place, running-wise and had a much clearer run. I finished in 231st position, meaning I had passed 340 runners during the run and came 151st excluding the handicap. I was 38th of the 49 medium pack runners and 16th of 89 in my age category. Gosforth came second in the division, missing out on first to Sunderland Strollers by a measly one point. Both clubs had two runners promoted this week, so the next fixture will be interesting. We won’t have to wait long for it as it is next weekend at Druridge Bay. Bring it on!